There are all sorts of fishermen, there are ones who live fishing in rivers or ones who like to fish in stocked lakes, and there are even the ones who love to go deep-sea fishing. For others, there is a combination of the above, and this is fishing out of a kayak. Some people might ask why fishing from a kayak is any good. It looks like to be a lot of effort and cost to do as you could from the side of a lake. But, this isn’t true. A lot of fish are not accessible from the water’s edge, and even deep sea fishing the boats need to roam around to find the best area. Kayaks allow fishermen to find the best positions while giving their fishing expedition a very different and relaxing element. Kayak fishing has actually been around for thousands of years, and it is only the methods of fishing that have really changed. There are a few advantages of fishing from a kayak, and maybe these might convince you, it isn’t a lost effort or cost as you might think. Access – kayaks can launch in water’s many boats can’t. There are more areas open to kayaks than boats powered by outboard motors. Lower maintenance – boats can cost much more to maintain or repair than kayaks, these savings can go toward many more kayak fishing trips throughout the year. Being stealthy – you can paddle carefully into fish populated areas easier than you can in a boat. Before they know you are there, you will have already landed a few. Being versatile – the right kayak can allow you to fish a range of water types. These can be from large lakes and reservoirs to tidal estuaries. Fully customizable – a kayak can be adapted for the type of fishing you like to do. It doesn’t matter if you are a fly fisherman or the type who want to fish with lures. A fishing kayak can cater to all kinds. Friendly to the environment – they are eco-friendly. With no fuels to leak, there is no chance to pollute the water and harm the fish you are trying to catch. There can be a substantial investment when starting kayak fishing, so getting the most for your money is crucial. Experienced kayak anglers know only too well that the most expensive kayak doesn’t mean it is the best. Some beginners ask ‘is kayaking hard?’ Because they think they might not be able to cope with paddling and fishing at the same time. This is where the different types of kayaks come into play. They can make it as hard or as easy as you want. This type isn’t as widely used by anglers because of the sitting position, for extended periods they can become uncomfortable. But, in certain situations, they can be better than a sit-on-top kayak. If you fish in cold, windy weather, a sit-in kayak will offer more protection. They give more stability, but the lack of deck space can be one of the most significant drawbacks. These are known as the best type of fishing. When in the right conditions, you can stand with no fear of capsizing while fighting a fish. This also allows you to cast properly rather than from being in a sitting position. They have lots of deck space for rods, tackle, fishing line and additional gear, and can even accommodate a full sized cooler. Due to the nature of them, the designs have improved, and now rather than using a paddle, there are pedal powered kayaks which can make things even easier for beginners. The longer the kayak, the more stable it is and the quicker it can cut through the water. Kayaks used for sea fishing are good examples of this where waters can be a little choppier than on a lake. One downside of a longer kayak is their lack of maneuverability. Shorter kayaks can be highly maneuverable, but speed and stability suffer as a result. With this in mind, most fishing kayaks tend to be between 10 – 13 feet in length. Width also has a significant impact because this is what can allow a fisherman to stand. The wider the bottom of the kayak, the more stable it would be. This width affects top speed so it would become slower. Most fishing kayaks fall between 28 – 40 inches in width and the most common breadths of hulls being 31 – 33 inches which can give the best speed and stability. 4. Is Kayaking Good Exercise? The amount of exercise you can get from going fishing in your kayak can vary on the type of kayak in use. Before, paddle kayaks were the only option, and these did give the upper body a good workout, but nowadays other types of fishing kayaks can be powered without the use of hands as a means of propulsion. Here are the three forms of powering your fishing trips with your kayak. Paddle kayaks – although this is the traditional type of propulsion, it can be hard to juggle paddles as well as your fishing gear when the weather is windy, and waters are a little choppy. If you want to stay in position, it might mean making use of an anchor line which in itself isn’t suitable. Getting them into the water can be much easier, and they do weigh in a lot cheaper than the next option. Pedal Kayaks – these are what is mostly associated with sit-on-top kayaks. They have a seat that is designed for the purpose, and then you power the kayak using pedals. This allows you to propel the kayak easier, and to give a lower body workout as much as the top. Upsides are you now have your hands free to cast your line, and land fish without resting paddles on your lap. They are also easier to keep steady rather than restoring to an anchor because you can pedal in either direction and quickly turn the rudder with one hand. When it comes to transportation, the pedals can be removed on some models, so when you look at the best car top carrier for your kayak, you need to see if you can remove the pedals and buy a carrier to suit. Motorized kayaks – these in effect are like a small power boat. You have a battery powered trolling motor for propulsion and to maneuver you into position. These can also make it easy to fight tides to stay among the fish. They are though, much more expensive and more cumbersome. There is also the other downside that you won’t get a workout if you resort to this form of propulsion system. There is also the problem that, they can’t go into shallow water. This can make it difficult to when getting in and out of the water, or fishing closer to the shore in some scenarios. Fishing kayaks are designed explicitly with fishing in mind. Even the aftermarket seats you can purchase are in some cases designed for fishermen. There are accessories you can add that will make your kayak fishing much more straightforward. Although there are a lot of items you can buy, here are some of what is available. Paddle – no matter what type of powered kayak, you need a backup paddle, just in case. Seat – seat upgrades are well worth it, factory installed are cheap and not always cheerful. Some come with a built-in pouch which is ideal to hold a first aid kit. Rod holders – these can be crucial while you are heading across the water, so your rods are out of the way. You also need rod holders to hold your rod once you are in position. Fishfinders and GPS – many anglers now use kayak fish finders to locate the fish and give themselves the best chance to catch more fish. Waters can be unpredictable. To make sure you are prepared for the worst especially if kayak ocean fishing. Here’s a list of what you need. 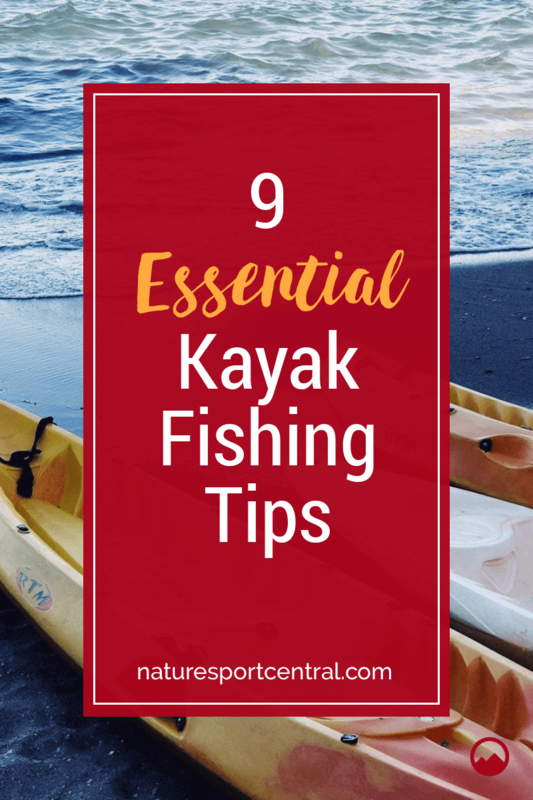 Kayaks are very versatile when it comes to fishing locations, but depending on skill levels, you might not want to tackle open water, to begin with. You can tackle offshore kayak fishing as long as you keep close to shore, this way you can get accustomed to how the kayak reacts. Lakes and reservoirs are good places to learn and also if you prefer sight fishing and aren’t bothered about landing a big fish to start with. If you start off following the steps like fishing for beginners until you gain experience, it won’t be long before you can hit the rivers and ocean to learn how to kayak fish in harsher conditions. This is one piece of advice that you won’t find in every great article on fishing tips. You can use the bait or lure to help pull you into position if they offer resistance against the water. When water is calm, it can take little effort to move a kayak. This can help you enter the fishing zone without disturbing the waters and the fish. This might not be a beginner fishing kayak tip that you can do straight away, but if you fish on rivers, using an eddy can be very beneficial. Head above the fishing point and tuck your kayak into an eddy. If you are in the right position, it takes minute adjustments every now and again to keep your spot. Thanks a lot for these tips, great article about angling from a yak!